Euroscepticism is opposition to the European Union (EU) and the process of European integration. It includes opposition to the euro, to the institutions of the EU, to European bureaucracy, to expansion of the EU, and to some existing memberships. The term Eurosceptic includes a very wide range of positions: from mainstream political parties which accept the EU but want to modify its structure, to those who see the EU as a wholly malevolent entity which must be destroyed. These positions might be labelled "soft" and "hard," or "moderate" and "extreme," but there are no official labels. In fact there is no official Euroscepticism at all, no central organization, no leaders, and no official ideology. In the United Kingdom, the Conservative party typically supports a "soft" Eurosceptic position of continued EU membership but with no further powers being passed to it, although many of its members would prefer that the EU return to a simple trade community along the lines of the old European Economic Community (EEC). This is probably due to the their dissaffection towards the € throughout the eurozone crisis. The UK Independence Party (UKIP) and the British National Party (BNP) support total withdrawal from the EU - a "hard" Eurosceptic position. Not shocking why. Populist parties in Europe tend to be Eurosceptic because it's easy (and not entirely unfair) to portray the EU as an elitist project. In the European Parliament itself, the Europe of Freedom and Direct Democracy group represents the "hard" position, and has members from 7 countries, but its largest parties are the UK's UKIP and Italy's Five Star Movement which together furnish 39 of the EFD's 46 MEPs (the other 5 EFDD parties each field only 1-2 MEPs). The EFDD has so far been the most stable of the "hard" EP groups, having survived for more than a single 5-year EP term. Former groups of a similar type have had a tendency to fall apart as their national populist parties had little or nothing in common beyond their opposition to the EU. In contrast to the EFDD, the European Conservatives and Reformists (ECR) group advocates a "soft" position, with members from 15 countries, but the bulk of its members are either British Conservatives or from Poland's Law and Justice party. The Labour Party has been broadly pro-European Union in recent years, although there are some dissenting Eurosceptics in the party, such as Kate Hoey  and Kelvin Hopkins. Although initially favourable towards the EU (as he was with the United Nations) due to the horrors of the Second World War, the left-wing Labour MP Tony Benn was a prominent figure in opposing Britain's entry into the European Common Market (the predecessor of the EU), saying that Edward Heath (then Prime Minister) had "sold out Britain's interests to the Common Market and gave our sovereignty away without our consent—with support of Mr Thorpe and the Liberals". During the 1975 Common Market referendum, Harold Wilson temporarily suspended collective ministerial responsibility and allowed a free vote on the issue, effectively letting Labour MPs vote according to their own consciences in order to prevent a split within the party. Despite UKIP leader Nigel Farage saying he would work with the current Leader of the Labour Party, Jeremy Corbyn for a Brexit referendum from the EU and Corbyn being considered a Eurosceptic in the past, Corbyn is in favour of Britain staying in the EU and does not favour Britain exiting the EU. This has raised issues within the Eurosceptic branches of Labour, as EU competition law (European Union directive 2012/34/EU) may prohibit policies such as the renationalisation of British Rail. In 2016, Britain voted to leave the EU — a move which, at the time, caused fears of a "domino effect". Thankfully, movements in favor of leaving the EU in other member states may actually have lost ground since Brexit passed. However, this spat of relief might change for the worse if and when the UK actually leaves, as (thus far) nobody really knows how the relationship between the UK and the rest of the EU will be from 2019 onwards. World War I and World War II, the reasons why the EU was formed in the first place. ↑ Before the 2014 EP elections the group was simply called Europe of Freedom and Direct Democracy and had fewer MEPs (34) than the EFDD (47), but from more countries (9 as opposed to 7). ↑ The 7 parties constituting the EFDD. ↑ About the ECR Group, from the ECR website. See also its own Brief History of the ECR Group. The ECR changed markedly after the 2014 EP elections as it was joined by several new parties, such as the Danish People's Party (which defected from the EFD/EFDD group). ↑ The Tories and Law and Justice together muster 38 of the ECR's 72 MEPs with an additional 7 from Alternative for Germany and 4 each from the Belgian New Flemish Alliance and the Danish People's Party, while the 17 other ECR parties only deliver 1-2 MEPs each. "Labour's new pro-Europeanism". The Economist. 2 Jul 2013. ISSN 0013-0613. Wintour, Patrick (14 June 2015). "Labour party forms pro-Europe campaign group". "Labour and Europe: Europhile and proud". 15 March 2014. Robinson, Nick. "Ed Miliband outlines Labour's EU referendum policy". "Alan Johnson's pro-EU group called 'Labour In For Britain' | PoliticsHome.com". 15 Oct 2015. "The Labour Party has become more pro-European as time has progressed". 3 Oct 2015. "Corbyn gives go-ahead for pro-EU 'Labour In For Britain' group run by Alan Johnson". 15 Oct 2015. Parker, George; Barker, Alex (2015-09-17). "Jeremy Corbyn vows to oppose 'Brexit' and backs EU tax on City ". Financial Times. ISSN 0307-1766. "Kate Hoey: Labour has become an "extremely unpatriotic" party". New Statesman. 17 June 2015. "Kate Hoey sets up Eurosceptic 'Labour for Britain' group". 18 June 2015. "Eurosceptic Labour MPs and top donor John Mills launch 'Labour for Britain' group". 17 June 2015. "EU referendum: Inside the Labour campaign resurrecting left-wing Euroscepticism". 9 July 2015. ↑ 10.0 10.1 Dathan, Matt (28 September 2015). "Jeremy Corbyn warned much of his agenda will not be achievable if Britain stays in the EU". The Independent. ↑ Discussed during this heated interview with John Bolton. ↑ "1975: UK embraces Europe in referendum". BBC: On This Day (BBC News). 6 June 1975. ↑ Speech in Bristol (31 November, 1973), quoted in 'Democracy in danger' warning by Mr Benn, The Times (1 December, 1973), pp. 1-2. Colin Pilkington (1 January 1995). Britain in the European Union Today. Manchester University Press. p. 119. ISBN 978-0-7190-4562-2. Stone-Lee, Ollie (29 December 2005). "How Wilson handled his Euro split". BBC News. Jones, Alistair (9 June 2015). "Collective Responsibility and the EU Referendum". Huffington Post. Chakelian, Anoosh (29 September 2014). "George Osborne: the EU referendum would be a free vote for Tory backbenchers". New Statesman. "In the 1975 referendum on the UK's membership of the European Community, the Prime Minister Harold Wilson decided to suspend collective responsibility because of his cabinet being split on the issue. Cabinet ministers were allowed to vote with their consciences and also to campaign against each other." ↑ Silvera, Ian (4 September 2015). "Ukip Say No to EU launch: Nigel Farage wants to work with Jeremy Corbyn in Brexit referendum". International Business Times. ↑ Eaton, George (14 September 2015). "Where does Jeremy Corbyn stand on EU membership?". New Statesman. ↑ Farage, Nigel. 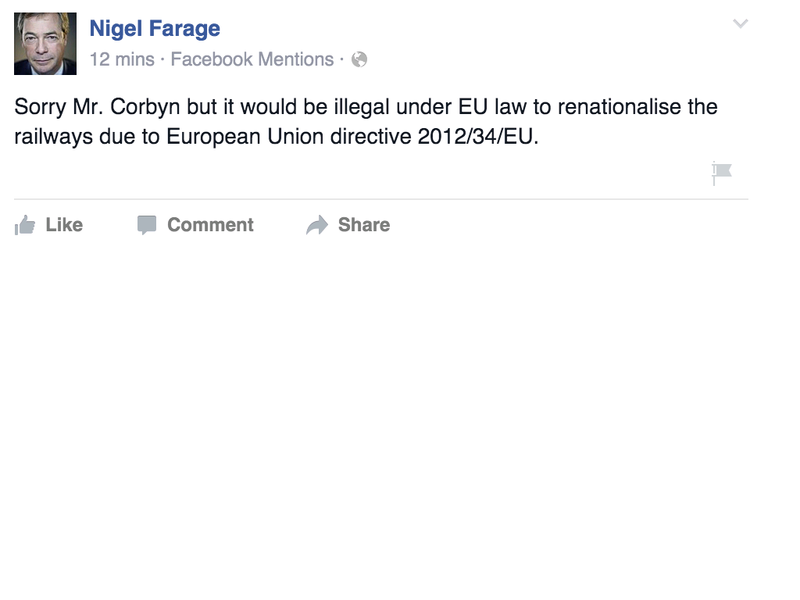 "Nigel Farage on Facebook (status)". This page was last modified on 7 July 2018, at 18:30.